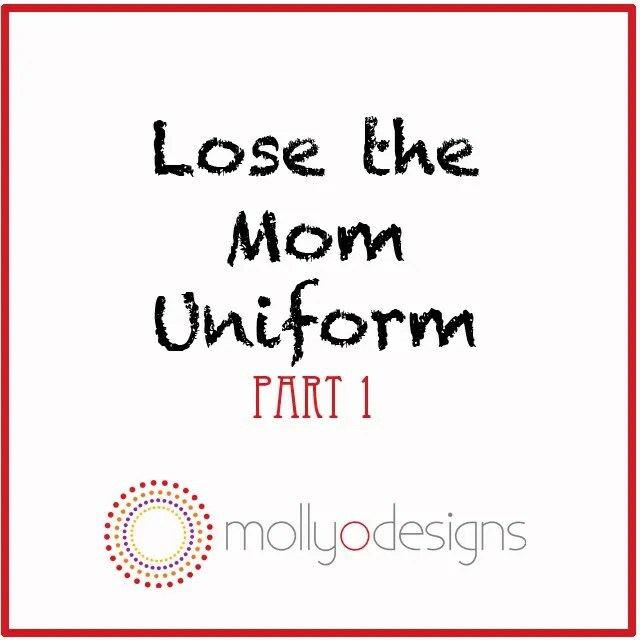 If You Do One Thing This Year………..Lose the Mom Uniform! I’ve decided to throw out my Mommy Uniform! You know the one that someone was handing out at the hospital on the post-partum floor? Except, I don’t remember actually receiving a bag with a mommy uniform, it just kind of appeared in my closet. Maybe they handed it to my husband while I was checking out. Yes, that must be it. And since nothing else in the closet fit when I got home, I just accepted it for what it was. A rather depressing glimpse into the beginning of my new image. Before my children, I prided myself on wearing fabulous clothes, shoes, accessories. Other women would ask where I shopped and if I would teach them to accessorize. But some how in the midst of having 3 kids in 4 years (yes, you heard me right) I transformed into a sweatsuit wearing, ponytail sporting, non-accessorized person. I’m not even going to say “woman” because there is nothing womanly about how I was feeling. How the heck did I get here, and how am I am going to get out? So I decided to lay down a few rules for myself. Should be easy, right? I did mention already that I have 3 kids under the age of 8? On second thought, maybe I will just buy a velour sweatsuit from Costco in every color they make. No, no, no! I’m going to do this. Back to the rules. We will be assigning one rule in each segment of my blog posts. I want to give you a little time to adjust to each rule. Remember I’m on your side. I am one of you. My muffin top doesn’t look any better in low-rise jeans then any other mom. Who am I kidding, they don’t even make low-rise jeans in my size. But I promise you, at the end of this series we will reclaim the right to feel and look fabulous together. It will be a transformation that is long overdue and greatly deserved. 1. Ponytails are not allowed unless someone in the household is vomiting, the water has been shut off because I forgot to pay the bill (I’m not super woman after all!) or my 3 year old has decided to cut my hair while I am sleeping. If you have met my youngest, you know this is a very possible and probable scenario. Take a minute and do something with your hair. I promise you will feel so much better!Last year I got a sassy new haircut and donated my hair to locks of love. I will tell you that I feel as cute as possible from 6:00 a.m. until 11:00 p.m. This is a first for me. If you are too afraid to cut your hair then buy or make a few trendy hair accessories. My favorite hair accessories are flowers worn off to the side and headbands with vintage buttons, brooches and feathers. If you MUST wear a ponytail, can you do me a favor and at least stick in a cute hair accessory so it looks like you “meant” to wear a ponytail? The best way to wear hair accessories is to keep everything else you are wearing simple and chic. Let your accessory be your focal point. If the accessories are scaring you, then just start with wearing your hair in any style besides a ponytail. Just one day! You can do it. Oh the beauty of a sock bun!! !